Office Depot Toner Catridge HP CF266A. Colour: Black. Office Depot toner cartridge CE250X. For up to 10.500 sheets maximum 5% coverage. Colour: black. Compatibility: HP Color Laserjet CM 3530 FS MFP CP 3520 Series CM 3530 MFP CP 3525 DN CP 3525 N CP 3525 X CP 3525. Office Depot Toner Cartridge CF281X. Page yield: 25000. Suitable for: HP Laserjet Enterprise M630 M630DN M630H M630F M630Z. Colour: Black. 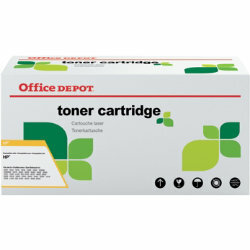 Office Depot toner cartridge CC531A. Page life: 2 800. Colour: cyan. Compatibility: HP CP2020 Series CP2025N CP2025DN CM2320 MFP CM2320XFI MFP CM2320N MFP CM2320NF MFP Canon LBP7200 Series MF8330CDN MF8350CDN. Office Depot toner cartridge CB541A. Page life: 1 400. Colour: magenta. Compatibility: HP CP1210 Series CP1213 CP1215 CP1217 CP1510 Series CP1515N CP1518N CM1312 MFP CM1312 NFI MFP Canon LBP5050 LBP5050N MF8030CN MF8050CN.